We wild camped at Stonehenge. Shall I say that again?? We WILD CAMPED at STONEHENGE. Yes, that ridiculously world-famous monument of incredibly massive stones dragged 100's of miles by prehistoric man to be arranged in a circle and no-one really knows why. That Stonehenge. Turns out, you can wild camp right next to it for the night. For free. Seriously, this was our view when we woke up the next morning! Feeling impatient? Watch the video of us wild camping at Stonehenge! What is The Drove, Stonehenge? We were looking for a campsite near the A303 on our way to Glastonbury (so many awesome things to do in Glastonbury if you've never been!) and we were excited to find ‘The Drove’ on searchforsites.com (here's the link to The Drove). We LOVE this website- full of loads of great overnight stop and wild camping locations like this, right across the UK. The Drove is a service access lane which runs right next to Stonehenge. Overnight parking is allowed and free! As far as we know, you can only access it from the A303 going East- we had to go up to the roundabout and turn around when we arrived as we were heading West and it's not possible to get across- so bear this in mind if you're driving from East to west… you'll have to turn around again. The Drove is a tiny lane with a rickety looking gate at the start. There is a lock on the gate but we don't believe it was locked at all whilst we were there, which was in September. 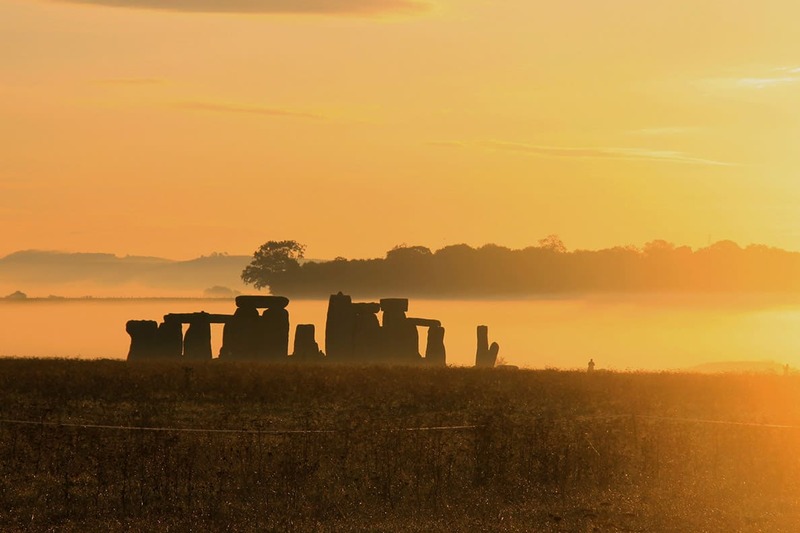 However, you might find it gets locked around the major festivals of the stones, such as the summer solstice on June 21st. When we were there, there was probably around 10-15 other vehicles already wild camping, all stretched along a mile or so of lane. Some looked like they had been there for some time. There is loads of room and pretty much all of it has spectacular views of the stones. You can see our motorhome in the photo below- and all the other vans wild camping down the Drove. We got up at 5am (yes, really) and braved the freezing cold- even in mid-September it was really, really chilly. I was so grateful for my mug of tea in my thermal Nespresso cup (seriously, these things are AMAZING! Keep a drink warm for hours. Check them out on Amazon here) We were amazed at such a clear and beautiful morning- it wasn't supposed to be nice weather and the rest of the weekend was horrible, but that morning we were blessed with one of the most incredible sunrises I have EVER seen. We launched the DJI Mavic Pro (have I mentioned how much I love this drone??) This was in the days before our quiet propellors had been added so we were trying to be really quiet and not wake our van neighbours. Luckily they got up too, so we were able to talk at a normal volume. English Heritage (the company who maintain the stones) employ security guards all night to ensure that no-one breaks in and damages Stonehenge. Part of their job is to ensure that no-one flies a drone over the Stones (Boooo!) So, of course, as soon as we launched our drone the guards ran over the field towards us and handed us a piece of paper which was supposed to look very official and terrifying. So, although we were legally allowed to fly (within the other rules of the Drone Law) we didn't want to cause any arguments or unpleasantness with the security guards. So we asked them where the exact boundary of the English Heritage lay, which turned out to be the field between the Drove and Stonehenge itself. Therefore, we could happily fly along the field on the other side of the Drove without any problems at all, (again, within the confines of the rest of the Drone Law of course!) So that's exactly what we did. The security guards were happy- we made them a hot drink as they were freezing – and we all watched the most spectacular sunrise I have ever seen together. As you can see on the video, the mist swirled around the stones and added to the utter magic of it all. We were surprised by how spiritual it felt. Neither of us are particularly religious, but we really felt the spirit of our ancient ancestors and wondered exactly how many people had stood looking at these same stones over the years watching the same sun rise over them. It was pretty powerful stuff! Just a note: You CANNOT get into English Heritage to see the Stones up close via the Drove. There is a path which takes you really close to them, but if you want to go in through the English Heritage access, you need to turn right out of The Drove back on the A303 (which is pretty much impossible, so go left then turn around at the next turning) and then follow the brown signs for Stonehenge/ English Heritage. This leads you to the attraction car park where you will be charged around £16 each (2017 prices). It is no longer possible to walk among the stones and touch them, even if you pay (not like you can in the Ring of Brodgar on Orkney). It's a shame, but the Stonehenge stones have been badly damaged by visitors, so they no longer allow access to the stones except to a few people on special occasions. With this in mind, my honest opinion is that you can see nearly as much if you visit Stonehenge for free and walk the path around the edge (also for free). I have paid to go closer to the Stones in the past and you don't get much better a view. Having said that, I would never discourage anyone from visiting and paying money to preserve our national monuments, so if you want to visit and buy tickets, full details can be found on the English Heritage website here. Whatever you choose, there's nothing to stop you wild camping for the night first and getting a view very few other people will ever experience. Longleat Safari Park- this drive-through animal park includes lions, tigers, rhinos, giraffes and many, many other animals. We went around in our Motorhome without a problem. Just be cautious if you go through the monkey enclosure- they do cause some damage! Bath- One of my favourite cities in England. The history, the architecture, the ice cream… it's definitely worth a day or two of your time. UPDATE: Sadly, I've been told that the Drove is now closed and it's no longer possible to park there. It's such a shame- I really hope they rethink it soon. But Stonehenge is still there and well worth a visit. Where's the best place you've ever wild camped? Let me know below- I'd love to check it out. I didn’t know you a “Wild Camp” at Stonehenge… Your drone shots are awesome. I like that you went to the effort of the early rise. All the best shots happen at sunrise or sunset. This is amazing! I didn’t know you could camp there! That is amazing! I loved your pix. I can’t imagine waking up and seeing that there. It was incredible- so much better than I expected. Totally recommend it. This is a beautiful place! I’m not sure I could cope with those potholes but from your photos it was all worth it! Oh yeah- they were pretty bad! But yes, definitely worth it. These is such a lovely journey 🙂 The pictures are epic and really beautiful. Thank you for sharing this. You’re welcome! I hope you can visit Stonehenge one day. Wow! What a cool experience. Stonehenge hasn’t been at the top of my list, to be honest, and your post made me want to go there sooner rather than later! Thanks for sharing! I hope you make it- and try to arrive for sunrise if you can. It was so beautiful. Waking up to Stonehenge… WOW! what an experience that must’ve been. The inspiration is real, thanks for the resource! You’re welcome. Hope you can use it yourself one day. Stonehenge is such a beautiful site. Unfortunately when I went there it was raining so much! It was change of seasons (october) but even though I left there soaking wet it was all worth it. Did you camp there in the summer? Oh no- what a shame you had to see it in the rain! Although I think the rain adds to the mystery sometimes! Yes, we were there in July 2017. Such an incredible sight! …and the powers that be have now closed access to The Drove….. however there are 3 other options 1. There are 2 parking spaces near and outside the official entrance for the night (Can’t see the Stones) 2. Woodhenge just around th corner (well 2 or 3 miles away) is worth seeing and you can park there 3. Stonehenge Campsite – great little site, but again can’t see the Stones. It appears the powers that be National Trust want to secure as must revenue as possible by closing off ‘free views’… but as the Security Guard told me.. you can’t legally stop people from walking near the stones at any time they want to. I love the idea of getting a drone btw.